The vast expanse of North America is home to more than 800 bird species, spread across an amazing variety of habitats. A Birder's Guide to Metropolitan Areas is the first guide to cover North America city-by-city. The book's birding trips visit most of the major habitats on the continent, among them some of the best birding sites in the U.S. and Canada. The more than 400 sites described include close-in urban parks and preserves as well as more-distant locations up to two hours from the downtown centre. Whether birding for two hours or an entire day, the birder will find specific directions and 160 maps to the most desirable birding sites in and around each city. Cities covered are Albuquerque, Atlanta, Boston, Buffalo/Niagara, Calgary, Chicago, Cleveland, Dallas/Fort Worth, Denver, Detroit, Halifax, Houston, Kansas City, Las Vegas, Los Angeles, Memphis, Miami, Minneapolis/St. Paul, Montréal, New Orleans, New York City, Philadelphia, Phoenix, Portland, St. Louis, Salt Lake City, San Diego, San Francisco, Seattle, Toronto, Vancouver, Washington, DC, and Winnipeg. Each chapter was authored by a local birding expert (or team of experts), and was compiled and edited by Paul Lehman, former editor of ABA's Birding magazine and one of North America's most travelled and most knowledgeable birders. This comprehensive guide to finding birds in North America's cities and environs will greatly aid any birder's search for breeding, wintering, and migrant species, vagrants, and other sought-after birds. 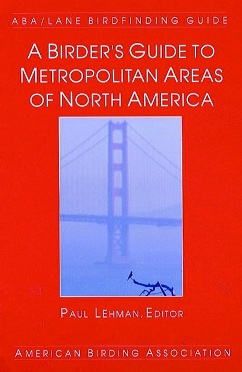 A Birder's Guide to Metropolitan Areas contains advice and directions for finding such species as Harlequin Duck, Snail Kite, Gyrfalcon, Spruce Grouse, White-tailed Ptarmigan, Yellow Rail, Rock Sandpiper, Atlantic Puffin, Northern Hawk Owl, Great Gray Owl, Red-cockaded and Three-toed Woodpeckers, Yellow-billed Magpie, California Gnatcatcher, Bicknell's Thrush, Le Conte's Thrasher, Cerulean and Swainson's Warblers, Baird's and Saltmarsh Sharp-tailed Sparrows, and many more. 504 pages.